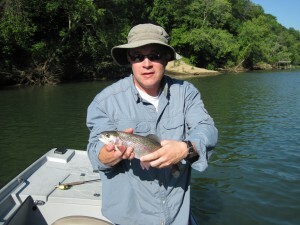 This was the 14th time this year we have had an angler catch their first fish on a fly. It never gets old! Tom from Memphis brought his son Andrew to the Little Red River and we landed his first fish on a fly rod using a #14 gray flashback Sowbug. That fly is now firmly stuck in Andrew’s favorite fly fishing hat. 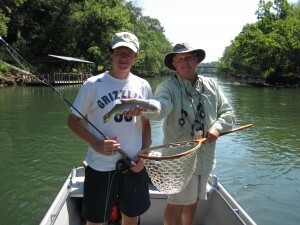 There is just something really special about father and son fly fishing trips that become really great memories as the years pass.